Over 1,900 historic broadcast recordings available streaming online! A searchable finding aid available on the Online Archive of California. Over 1,900 recordings streaming freely on the Internet Archive and the UC Berkeley Library catalog OskiCat. Item level descriptions of recordings available on the Pacifica Radio Archives online catalog. A manual for completing similar digital preservation projects. We invite you to listen to these historic recordings and share with fellow students, researchers, professors, librarians, archivists, and media creators far and wide. We want to say a special thanks to the National Historic Publications and Records Commission of the National Archives and Records Administration for their matching funds making this project possible, and to our partners: the Internet Archive, UC Berkeley Library, and George Blood, LP. A beautiful article about activist musician Malvina Reynolds by Gabriel San Roman was published this week in the OC Weekly. Audio preserved as part of the American Women Making History and Culture: 1963-1982 project was used for research for this article by Gabriel. And the piece includes a link to a recording of a conversation between Malvina and activist Dorothy Healey preserved in this collection. 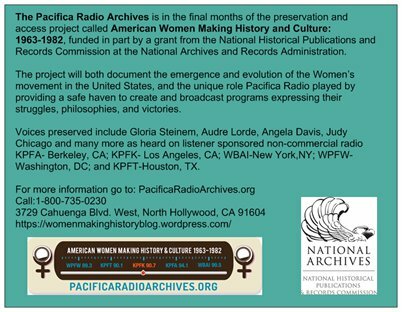 Enjoy Gabriel’s wonderful article and this interview on behalf of the Pacifica Radio Archives and the American Women Making History and Culture project! Also, browse other recordings of Malvina preserved in the project here. We are so happy the audio preserved in this collection is being used for wonderful work like this! Thank you to the NHPRC for their generous funding for the American Women project. We are pleased to share that all of the audio from the American Women project (2,024 recordings total) has been digitally preserved from reel-to-reel tape and each recording has been listened to, researched, and described according to the PBCore metadata standard! 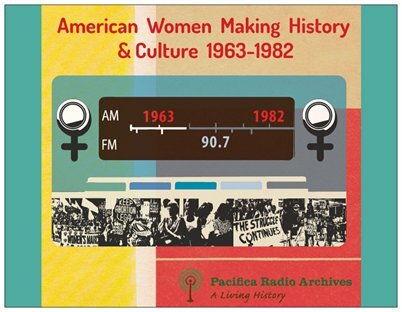 All of the updated catalog records be found here: http://pacificaradioarchives.org/subject-tags/american-women-making-history-and-culture-1963-1982. The audio files and metadata have been shipped to U.C. 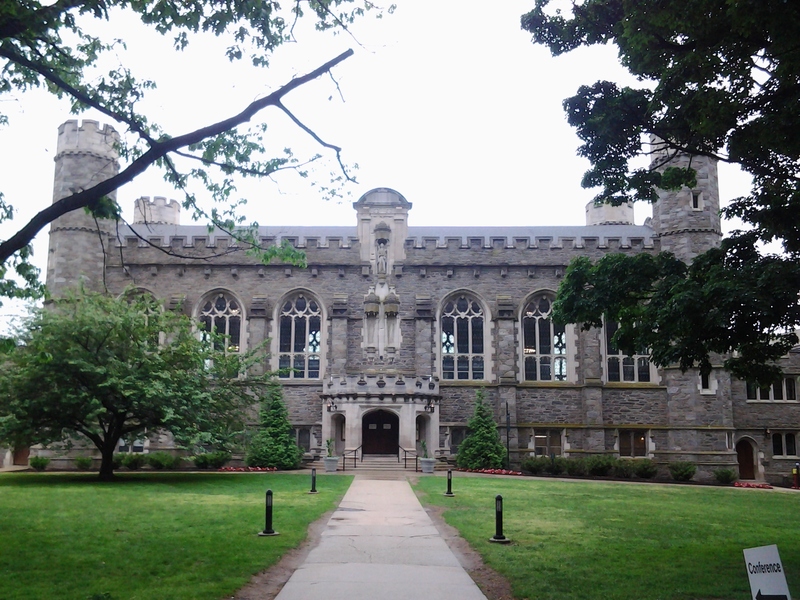 Berkeley, where they will be ingested into the U.C. Berkeley Library system and records for each recording will be published in the OSKIcat online library catalog. The audio will be available streaming there as well! We are so grateful to U.C. Berkeley for hosting and preserving the audio included in this grant project. Once the recordings have been posted on OSKIcat, links to those records will be made available on Pacifica Radio Archives’ website. We are looking forward to sharing this important collection with the world soon!! Greetings! 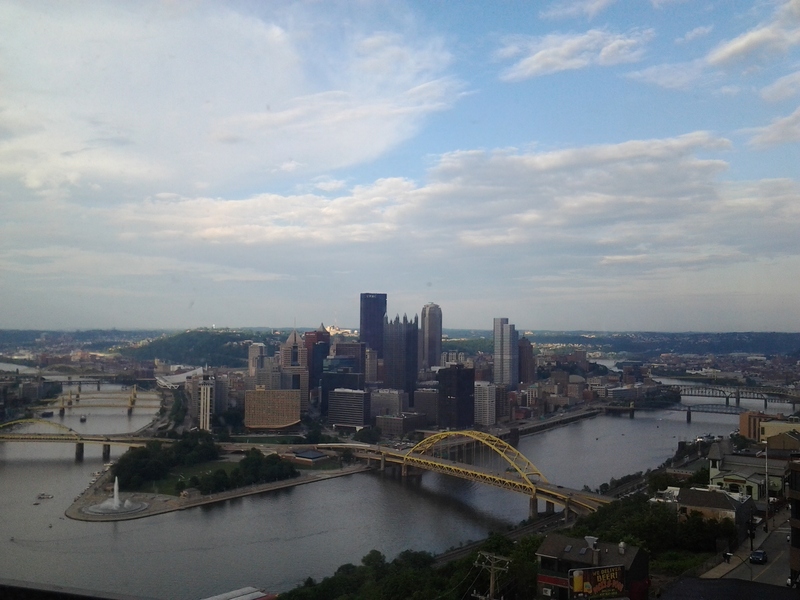 I recently returned to Los Angeles after a trip to Cleveland for the Society of American Archivists 2015 Annual Meeting. This trip and conference was an opportunity to let other archivists know about the important work we’re doing here at Pacifica to preserve women’s history, and to find out more about similar undertakings at other institutions. My first two stops were the Recorded Sound Roundtable and Women’s Collections Roundtable meetings. At the Recorded Sound meeting we learned about the state of the initiatives having to do with Audiovisual Archives collections, including the publication of the ARSC Manual and the upcoming AMIA conference in Portland, OR. We also discussed initiatives the Roundtable might want to undertake during the 2015-2016 year, trainings seeming to be the most popular idea. I announced at the Women’s Collections Roundtable that we are almost finished with the American Women project (!!) and received enthusiastic interest and encouragement. Postcards announcing the project were also made available at the conference. On Thursday afternoon I presented with Carrie Daniels, Director of Archives and Special Collections at the University of Louisville, Aaron Rosenblum, Associate Curator of Special Collections at The Filson Historical Society, and Josh Ranger of A/V Preserve on the topic “Can I Trash This? Managing Physical Media Collections Post-digitization“. We had an energetic conversation about the special needs of audiovisual materials and why institutions choose to hold on to the analog materials once they’ve already been digitized, especially in light of their short (10-15 year) future lifespan. I talked about how as a result of the American Women project, we now have a plan to store digital preservation masters at the California Digital Library, Internet Archive, and in house, and are shipping the master tapes to the University of Maryland for long-term safekeeping. This will allow more room in our in-house vault for finding, digitally preserving, and making accessible more gems from our collection. The conference allowed for more connections with Women’s collections archivists who can spread the word about the American Women collection to scholars and researchers at their institutions, and with audiovisual archivists with whom we are sharing ideas and best practices for preserving and sharing our collections. Thank you to the National Historical Publications and Records Commission for their support of this great project. Pacifica Radio Archives recently submitted our quarterly report to the National Archives, describing the grant project activities undertaken during the quarter that included January, February and March of 2015. Highlights include the many ways we’ve promoted the project, particularly during March–Women’s History Month, via social media ( https://twitter.com/PacificaRadioAr, Soundcloud.com https://soundcloud.com/pacificaradioarchives, and Facebook https://www.facebook.com/groups/19664526892/), via public service announcements on the radio, and events including the March 28th “Anaïs Nin’s Influence: Women who Knew Nin Talk About her Writing, Her Life and Their Friendship with Her” at the City of West Hollywood City Council Chambers and March 31st “Poetry Slam at Busboys and Poets” in Washington, D.C.
Feel free to peruse the report by downloading here: NHPRC report_April 30 2015. 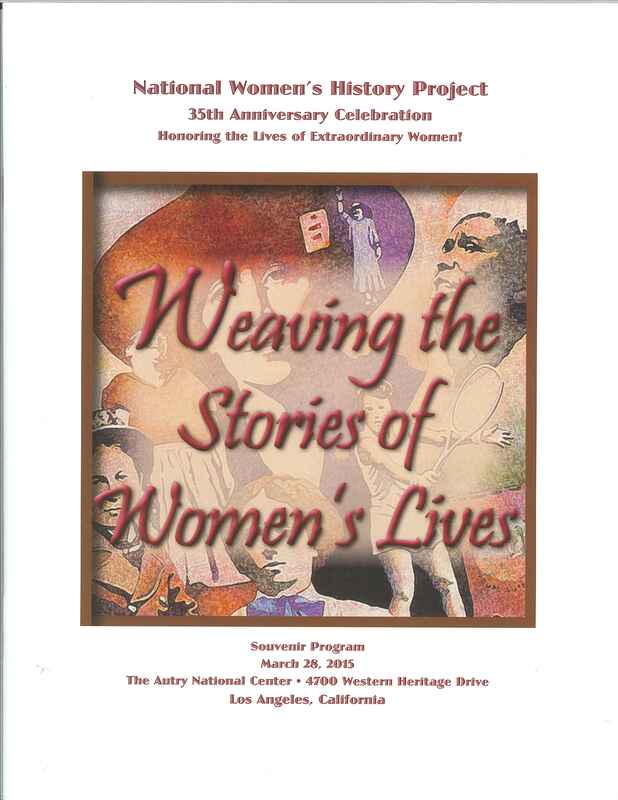 On March 28th, 2015, Project Archivist Jolene Beiser and Pacifica Archivist Holly Rose McGee attended the 35th anniversary celebration of the National Women’s History Project in Los Angeles. The archives donated a package of women’s recordings as a silent auction gift. An advertisement for the Pacifica Radio Archives was included in their event program which you can see below. This shows how important our materials are to the people who are continuing to work toward a more equal society. Hi! 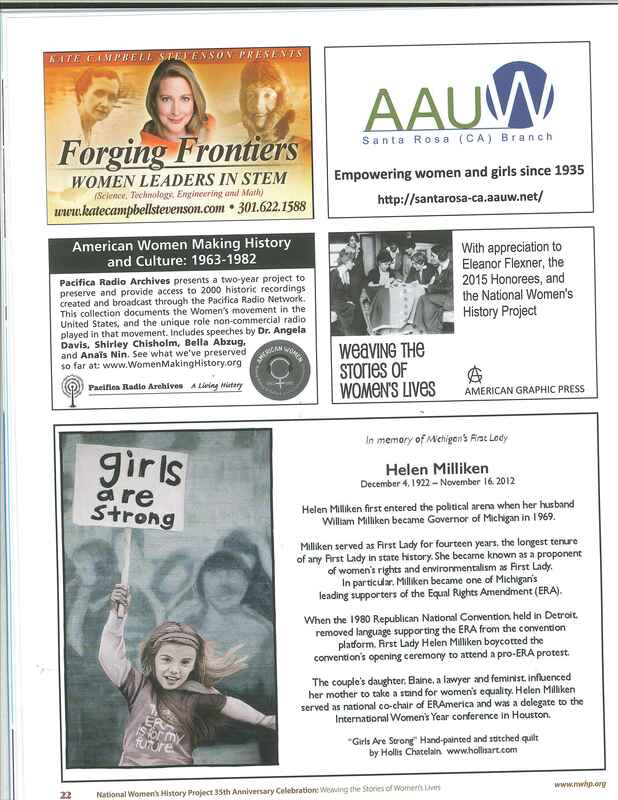 We’re excited to write you about our progress with “American Women Making History and Culture: 1963-1982” and give you ways to help us promote it further. Because of you we received the support we requested from the National Historical Publications and Records Commission (NHPRC) at the National Archives and Pacifica Radio Stations and listeners to do this project. We’re in the homestretch. 1500 recordings of Pacifica Radio Station broadcasts documenting The Women’s Movement in the United States (1963 – 1982) have been transferred from the reel-to-reel analog tape and we’re already in the cataloging and description phase. We’ve finished pre-processing the remaining 500 that are being digitized at George Blood Audio. HEAR some these extraordinary recordings: Congresswoman Bella Abzug describes being a woman in politics during the “Decade of the Woman” (1981). Suffragist Isola Dodic remembers marching around the White House in 1913 to win women the vote (1978). Actress and activist Ruby Dee speaks about fighting apartheid in South Africa (1964). Poet Audre Lorde recites “To Be Young, Black and Lesbian” (1982) and early (1970’s) “consciousness raising” sessions, broadcasting all the personal and noisy revolutionary fervor for the world to hear. How you can help us now! Please answer the following questions so we may serve our mission to have these materials used in various settings, academic, film, television, news, etc. 1. When all the audio and descriptive records are available in December of 2015, how can we alert scholars, artists, journalists and educators they are here? 2. Whom shall we contact? What will they need to know about the project? 3. Are there organizations, publications, or individuals that would be interested in spreading the word about this collection? Can you contact them directly? Or, give us an introduction? Please let us know!!! 4. What is the best form in which to present this material, and knowledge of its existence, so that it will be used? What will users have to know? 5. Can you select a recording, request a copy, listen to it and write a review or comment? This would enhance our online presentation, reports to the NHPRC and serve one of our project objectives to show increased use of the materials. How you can help us continue! This month celebrates the 100th Anniversary of the founding of the Women’s International League for Peace and Freedom (WILPF)–founded in 1915 in the midst of the first World War. The Women’s Power to Stop War Conference is currently underway at the Hague in the Netherlands to commemorate this important event and the women who have been fighting for Peace all over the world. Naturally, Pacifica Radio has interviewed several members and recorded several events of WILPF over the years, and we have found six such recordings, four of which are included in our American Women Making History and Culture project. You can see descriptive records for these programs here: http://pacificaradioarchives.org/subject-tags/womens-international-league-peace-and-freedom-0. These recordings and an other 1,996 will be available streaming through the U.C. Berkeley Library’s online catalog and through the Internet Archive this fall! Stay tuned!